My stencilling work area is often the corner of the kitchen table. 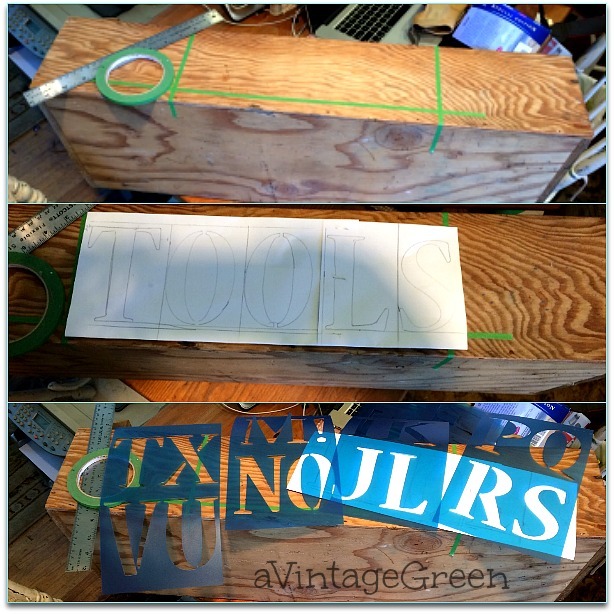 Before I touch paint and brush I plan the word I want to stencil (from individual letters). In this example I am using 4 inch letters. I make myself a paper plan, including the space between each letter. Next I tape the bottom line for the letters and the beginning and end of the word as it matches the paper plan. I like to use the thickest mil plastic possible when stencilling to help keep the letters from tearing. It is the same for larger theme stencils from Donna of Funky Junk Interiors or Angie of Knick of Time. I bought the Alphabet stencils from Michaels. I organize the letters I want to use just to make the stencilling go as quickly as possible. 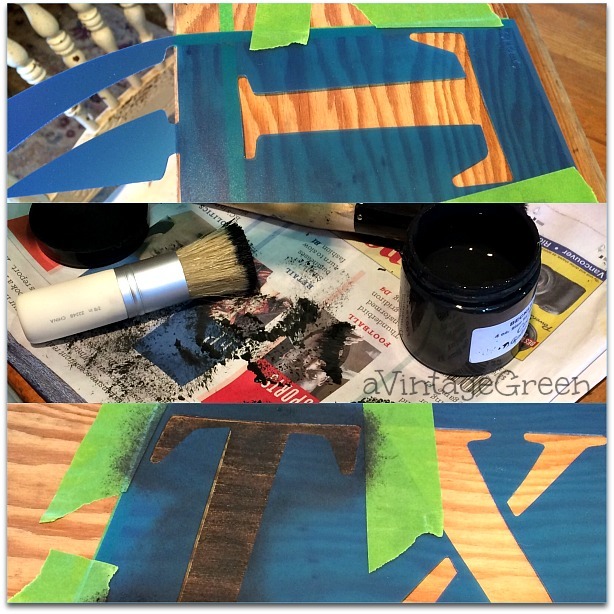 I tape each letter (one at a time) in place as well as hold down (blue only) areas where I am stencilling. I have newspaper handy to dab OFF paint from the stencil brush so I get a VERY light dabber as I stencil. The stencils I am using are a heavy mil plastic. I also tape edges of a letter to make sure I do not stencil outside of the (T) letter - and it is a good idea to do that BEFORE you start the stencilling of a letter. As each letter was stencilled and dry to touch I added the next letter. I checked my distance between each letter with a ruler as I taped the letter in place. I removed all the tape, collected my supplies, cleaned things up and put them away. And what was I stencilling TOOLS on? 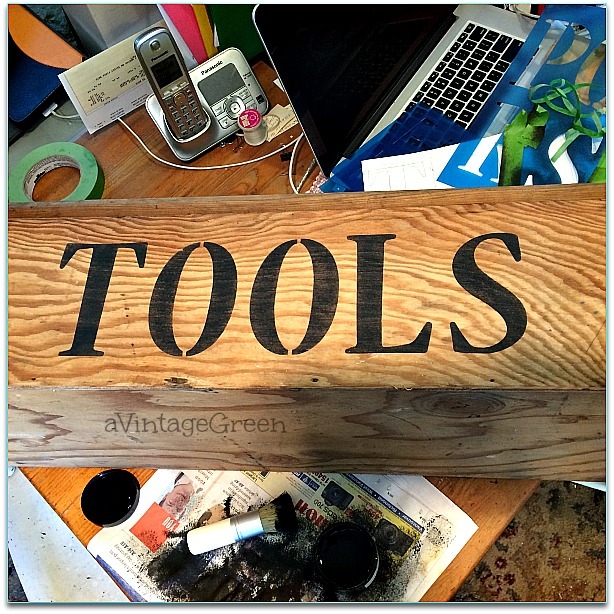 A carpenters tool box. 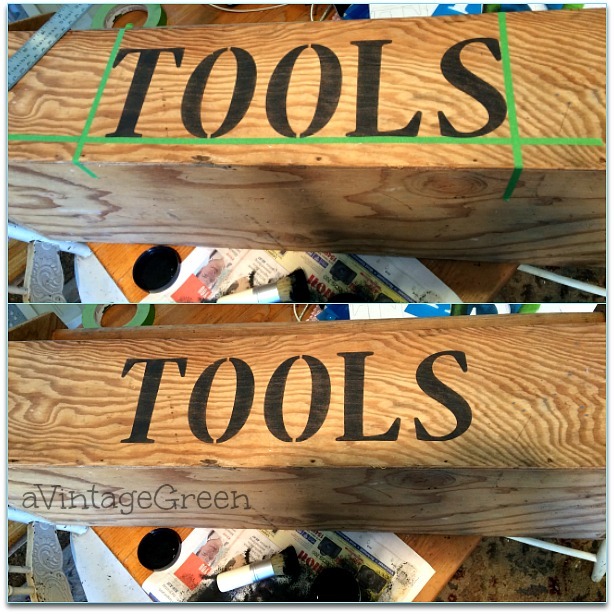 The final touch was to sand the letters down to show wear and give the entire tool box a clear coat of wax and then a polish. 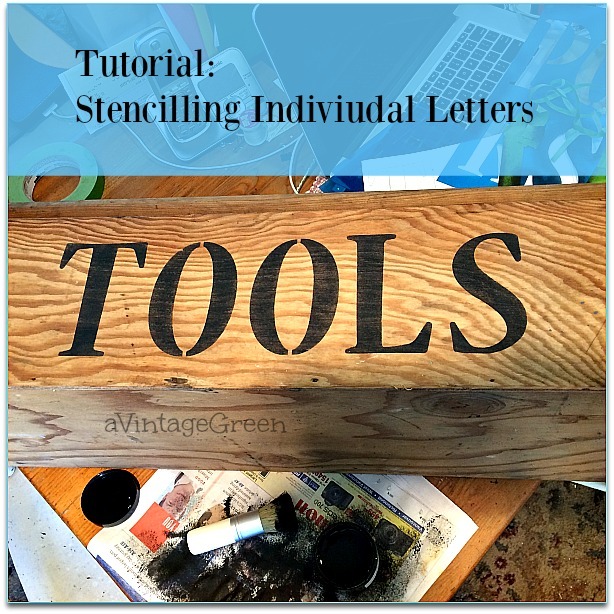 Since I frequently write posts about stencilling I decided I would write a reference stencilling post, using individual letters to make words. I will be linking back to this post if an example of 'how' is needed. As soon after stencilling each stencil should be cleaned. I use water (since I used chalk-clay paint) and dish soap. I usually have some water in the sink and drop the used stencils in to soak. I rub the paint off each stencil paying extra attention to NOT bending or pulling on the thin lines (see 0). I pat the stencils dry and clip them back with the rest of the letter set. Judy of North Ora had a suggestion about not cleaning a stencil to make the stencil stiffer. I am going to try that with the very thin plastic stencils next time I use one. I have also learned that I need to carefully clean any paint from the inside rim of the paint lid (screw on lid) and from the outside rim of the paint container (again, screw on) so that the paint doesn't dry to itself and make opening the container next time difficult when you want to use it again. I read recently that putting a piece of plastic wrap between the container and lid before screwing the lid on is a good idea. I am going to try that too. I've been wanting to make a sign, but I've never done it before and am a little timid about starting! Love your tool project. Perfect for all of those must haves! I don't wash my stencil the first time I've used it to make it a little bit sturdier. Just works for me. Good morning Joy. Your stencil tutorial is wonderful. I tried stenciling and I really did not know what I was doing. I gave it up. 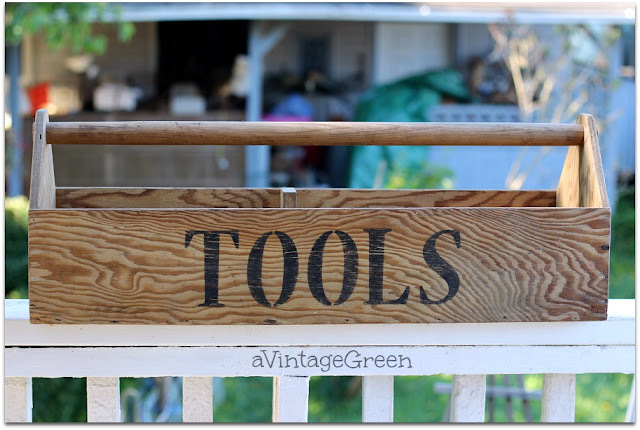 I will have to rethink stenciling after reading your post today. Big smile here. Thank you for joining Blue Monday at Backyard Neighbor. Was never good at this. But you do a super job. I enjoyed your tutorial! Stenciling is something I need to improve upon... Thank you for the tips. 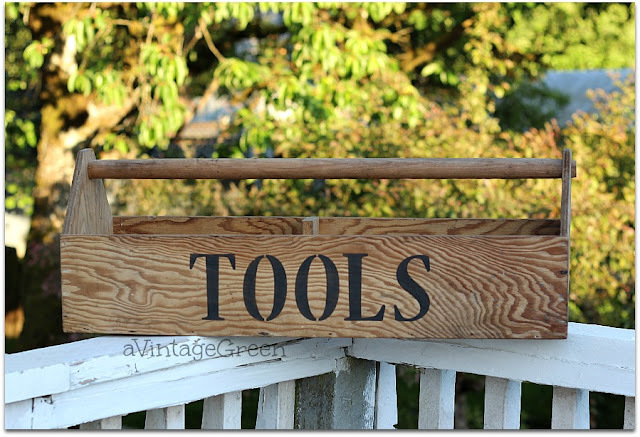 Very nice--I buy every tool box I can find. Thanks for linking up to the Talk of the Town party! Love your rustic old toolbox. 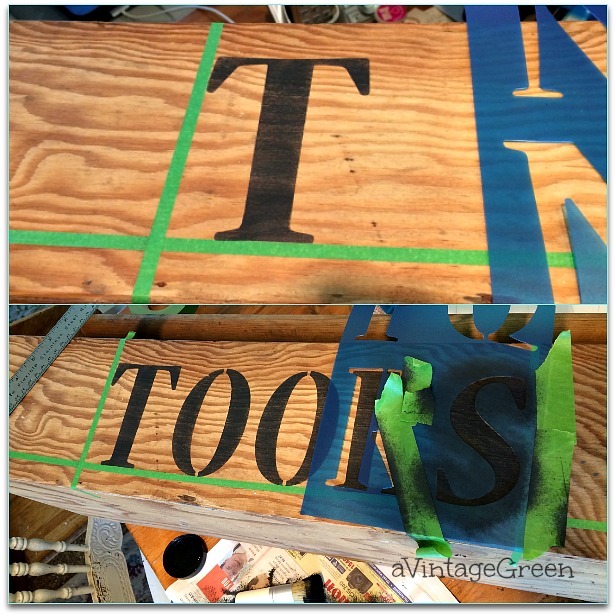 Thanks so much for sharing your stenciling tips with us at Talk of the Town. I love the look the box has with the stenciled letters. It makes it look perfect! Thanks for sharing with the Tips and Tricks Link Party. Thank you for sharing this. I would like to try my hand at customized artwork and I would love to try this. I just hope it will be as easy to do as it looks. Your work has inspired me. I’m already excited to go out and buy the materials I will need. Wow, thanks for this post! Perfectly timed as I just bought a Portrait. Can’t wait to get started!